ASP.NET Web API is a new framework designed to simplify web service architecture. So if you’re tired of interoperability issues between inflexible web services and clients tied to specific platforms or programming languages, or if you’ve ever struggled with WCF, this book is for you. In Part I, you’ll get up to speed on Web API’s modern HTTP programming model, REST and your hosting options. Part II takes you through building a real application so you can see straight away how to put this new technology into practice. The second half of the book features dedicated chapters on topics like routing, controllers, validation and tracing, and the authors close with discussions on performance, security and an all-important look at unit testing to help you prepare your application for the real world. 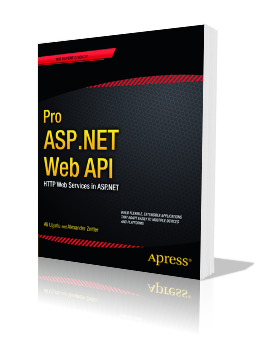 Whether you’ve previously worked with WCF or are an ASP.NET developer diving into web services for the first time, Pro ASP.NET Web API will show you a clean, modern approach to building HTTP web services.